It’s spring of your senior year of college, and the question is coming up more and more: what are you doing after graduation? This loaded question can generate a lot of anxiety. What am I going to do after graduation? What is life going to be like once I leave the familiarity of campus? In the fall of 2017, 20.4 million students were enrolled in American colleges and universities. Thankfully, I’m not the only one who’s trying to find the answers. In my quest, I’ve explored three options—as an almost graduated senior—on what life will be like post-grad. 1. Get a Job or Go Back to School? In a post-graduate study Messiah College conducted for its graduating class of 2016, only 14% of graduates decided to continue their education while 84% were fully employed and 2% were still looking for work or further education. If you have student loans to repay, it may be in your best interest to get a job and start paying off your debt as soon as possible. In Pennsylvania alone, the average college student debt is $33,264. If you really want to pursue graduate school right after graduation, how can you do that and not go deeper into debt? Graduate Assistant programs are available at universities around the country, and you can work for a university while you get your graduate degree. A great option—and one that’s financially smart—is to ask your employer if he/she will cover some of the graduate costs under professional development. In a recent GoGrad.org article by Jesse Mecham, he offers strategies to negotiate with your employer to pay for your graduate studies and other expenses. The article also lists 15 amazing companies that are willing to pay for your graduate degree. Just because your employer doesn’t have a graduate school benefit doesn’t mean you can’t structure your own ask and present it. Be clear, address why it’s an advantage to the employer, explain what the costs will be, and specify how it will positively benefit their company. 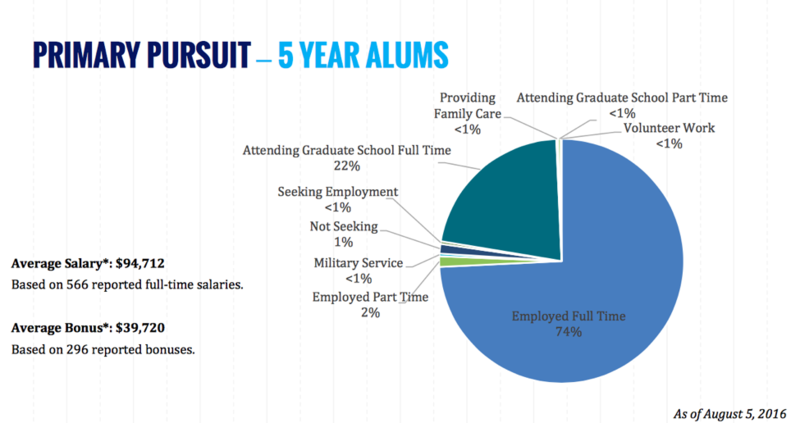 Almost a quarter are attending full-time graduate school. Most likely they waited and saved their money in order to pay for their education, or their current employer is paying a portion of their program. Whether you go back to school or start your career, you have to keep your financial future in focus. With each delayed year of entering the workforce, you’re accruing debt while forgoing any retirement savings. That might seem like something you shouldn’t be concerned with at 22 or 23, but with compounding interest doing its magic, each year you postpone earning and saving can turn into thousands of dollars in lost money. And if you stay in school longer, you may miss out on employment opportunities that could set you up for success in the long run. 2. What If I Don’t Have Five Years of Experience? I asked a few friends who were recent grads about what their concerns were before they left college. My friend Brooke, Messiah College class of 2016, gave me a great answer. She said she definitely felt “the pressure of having real deliverables rather than just grades.” There is no way, as a college student, you can have five years of experience for an entry-level job. But there is a way for you to make it look like you have experience out of school. Getting an internship over the summer or during the semester is a great way to generate experience. How do you do that? Read my blog post on getting the internship you need before you graduate. The next step is to meet with your professors, and see how you can leverage your class work into your professional portfolio. In my case, I was able to show that what I learned through the projects I worked on in class made me the most qualified for the position I wanted. You don’t necessarily need to show that you increased revenue by 6% over the past five years, but when you demonstrate strategic thinking and an understanding of business, it can be the advantage you need in the hiring process. 3. How Am I Going to Pay for Everything? The final thing I know most of you are worried about is finances. I ask myself regularly, “How am I going to afford to live on my own and afford to do the things I love to do most?” My friend Claire touched on this subject when I asked her what life was like post-grad. She moved out immediately after graduation and is completely financially independent from her parents. It was expensive, but she learned quickly to be wise with her entry-level salary. “I have my weekly date with Excel to go over my finances, so I know where I am allocating my expenses. It makes you feel free knowing what you can spend but also knowing you have a responsibility to make rent, loan payments, car payments, buy groceries, and also have fun.” Finding your financial rhythm initially can be tough (let’s be honest, a lot of adults haven’t found it! ), but making a spreadsheet for each month or getting an app like Mint that allows you to create a budget in all areas of your life will help you make sense of the financial turmoil you may face after school. When you think about your future, remember that it’s okay to not have everything figured out. You have the rest of your life to decide what you want to do and be. Enjoy your time in college and enjoy your time post-grad knowing everything will work out in the end. Your first job out of college does not have to be your dream job; however, never stop looking for your dream job. Hard work and determination are the keys to success in this ever-changing world. So, what are you doing after graduation? I’d love to hear about it! Email me at gmunford@deetergallahergroup.com.